A coring system saves the inside of the bowl that would normally be turned to shavings. The profits from these "extra" bowls will pay for the coring system and utilize expensive wood to a maximum. The Easy Core has a secure smooth feel when in use and does not feel "grabby". The Easy Core features a pivot arm with a replaceable cutter. The pivot arm rests on a support finger that keeps vibration to a minimum during the cut. 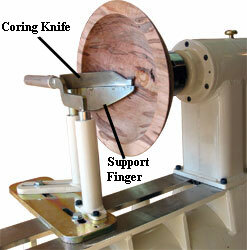 The support finger is held on a separate post that is adjusted for each size of core being cut. A 12" long handle is included to attach to the pivot arm for the operator to hold on to during the cut. The cutter is designed so that no relief cut needs to be made like some other systems. As the cutter penetrates the wood, clearance is created on each side. The cutter is made of CPM M-4 high speed steel to stay sharp longer and can be easily replaced. The Base Set includes the support base, two posts, spacers, Handle and wrench. Base Sets are available to fit 16", 18", 20" or 24" swing lathes. Please indicate the make, model and the swing of your lathe when you order to assure a proper fit. The Knife Sets available for coring are able to cut sizes approx. 1-1/2" larger or smaller than the size listed. The following sizes are available: 9", 11", 13" and 16". Each knife set includes a support finger of the proper size to support the arm and reduce vibration. Each knife set includes a replaceable CPM M4 HSS cutter. A clamp block to fit your lathe must be ordered separately from the list below to attach the base set to your lathe.